Boys Basketball, Girls Basketball, Cross Country, Soccer, Crew, Track and Field, Tennis, Girls Volleyball, Lacrosse, Spirit Squad and Ultimate Frisbee. 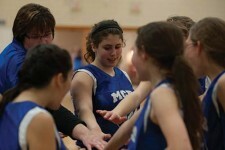 MS volleyball practices are held at MCDS, and the team competes against other private schools within the Madison Area. The MS volleyball team is coached by Kristina Luedtke*, Bethany Schmidt, and Darla Kurth. MS soccer practices at MCDS and the team competes in the recreational MAYSA leagues as members of the Capital East Soccer Club. The team competes against other club teams within the greater Madison area. The MS cross country team consist of Sixth through Eighth grade students. Practices are held at MCDS and the team competes against other public and private schools within Southern Wisconsin. The MS cross country team is coached by Mary Langlie and Pat Acker. Sixth through Eighth Grade students make up the MS cross country team. Practices are held at MCDS and the team competes against other public and private schools within Southern Wisconsin. Mary Langlie and Pat Acker are the coaches. The MS girls basketball program consists of two teams that play games around the Greater Madison Area as part of the Madison Area Independent Sports League. All practices and home games are held at MCDS. MS girls basketball is coached by Pat Acker and Eric Cooke. The MS boys basketball program consists of two teams that play games around the Greater Madison Area as part of the Madison Area Independent Sports League. All practices and home games are held at MCDS. MS boys basketball is coached by Jeff Stenroos* and Jeremy Clements*. The MS track and field team participates against other local private middle schools within the Madison area. All of the practices and home meets are held on our university quality track. The track and field team is coached by Pat Acker and Eric Cooke. The MS ultimate team competes against other local middle schools. All of the team practices and home games occur at MCDS. The MS ultimate team is coached by Galen Wiese. The MCDS crew team is a recreational opportunity for our student-athletes to learn more about and participate in the great sport of rowing. All of our team practices occur at MCDS or on the attached Cherokee Lake. The crew team is coached by Chris Dry and James Hallick. The MS boys lacrosse team participates in the Madison Area Lacrosse Association (MALA) through our co-op with the Westside Lacrosse Club. The teams practice and play their home games at various parks on Madison’s west side. Schedules for the various MS lacrosse teams can be found on the Westside Lacrosse website. The spirit squad consists of MS students who generate school spirit and perform at various athletic department activities including home boys varsity basketball games. The spirit squad is a combination of traditional cheerleading and poms. Spirit squad is coached by Heather Jones.